Whether you live in a smaller apartment or are simply trying to furnish a guest house, there are plenty of instances where full-sized appliances will not do. Washer and dryers solved this problem by stacking one on top of the other – the applies for refrigerators and freezers. Some appliances are not so easy to re-engineer, so the market simply miniaturizes it. This is the case for the best 18 inch dishwasher that is made to fit in a smaller space than a full-sized appliance. However, this miniaturization does not affect the product’s ability to perform which is why we bring you the 5 best 18 inch dishwasher brands of 2019. If you have no time to read: in the price category up to $1000, our winner is Bosch SPX68U55UC, while EdgeStar BIDW1801SS is the most budget model among the quality ones. 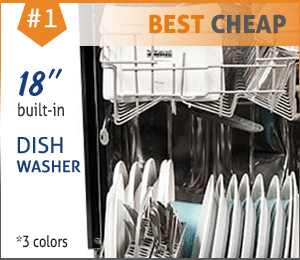 And if you are still looking for the best price: 8 cheapest 18″ dishwashers. Though the different products on our list might seem fairly similar from the outside, there are a litany of nuances to distinguish them. Many of the more expensive models we saw a littered with additional bells and whistles, but it seems that the primary difference in price will come down to the motor’s power and the dishwasher’s capacity. Everything else is little more than window dressing and rarely moves the needle the same way that the motor or capacity can. So, let’s take a closer look at 5 popular models of 18 inch dishwashers from 320 to 950 dollars. Bosch may be far more well-known for their brand of power tools, but the company realized that they could put their engineering genius to work in every consumer market. As such, Bosch Home offers a wide range of high-end consumer home goods that can compete with any top of the line model out there. This is because Bosch specializes in precision and durability – a holdover philosophy from their power tool brand. Thankfully, for both Bosch and us, the consumer goods market is rife with pretenders that slap a chic exterior over a substandard machine. This allows the Bosch Home brand to truly stand out for their commitment to excellence when it comes to the “guts” of their products. That said, there are still a couple of areas where the Bosch is somewhat average, but even then, average is still pretty good. 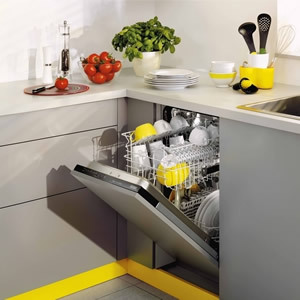 For instance, the industry standard for the dishwasher market, regardless of the size, is to make the interior out of a rust and corrosion-resistant material. Lower-end dishwashers will use some kind of plastic like PVC or nylon, but the high-end dishwashers, of which the Bosch is one, use metal. 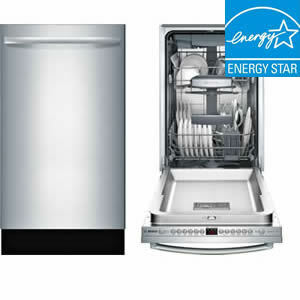 Specifically, the high-end dishwashers use stainless steel, which the Bosch dishwasher also uses. However, we cannot help but wonder how much better this dishwasher might be were cabin made of aluminum instead of stainless steel. Regardless, when it comes to pretty much every other relevant specification, the Bosch is heads and shoulders above the rest of the products we saw. Keep in mind, many dishwashers will include convenience features that are pretty much bells and whistles, flash but no substance. For the Bosch, you get the flash and the substance as this dishwasher has by far the largest capacity that we saw. Remember, all of these dishwashers have roughly the same amount of cubic feet to work with, so the separation between them often comes down to engineering design. Still, no matter how you cut it, the fact that the Bosch dishwasher has twice the capacity of over half the products we reviewed is impressive. Part of this additional capacity is due to how the racks are engineered, but a good bit of it has to do with the racks themselves. For instance, the Basch is the only 18” dishwasher on our list that comes with a 3rd extra rack for your smaller dishware. Beyond that, the Bosch is also one of the few dishwashers that we saw that allows you to adjust the racks’ position to numerous settings to accommodate your needs. The patented RackMatic not only allows you to change the rack’s position, but it offers significant flexibility with that arrangement as well. Beyond the convenience of adjustable and additional capacity, the Bosch also shows up in a couple of the other most important areas. For instance, there is not another 18” dishwasher on our list with a more powerful motor than the Bosch. This is important for 2 reasons: first, a stronger motor will be able to work longer without failing. Second, the more powerful motor is able to better handle the water pressure necessary. To make sure that the water pressure is not hindered, the Bosch dishwasher also has anti-leak AquaStop protections. Frigidaire is one of the oldest and most prestigious manufacturers of consumer home goods in the market. This reputation has been earned over the course of a century in business regularly leading the market in consumer home goods. In fact, Frigidaire is actually the company to make the first consumer refrigeration system ever. This development was so impressive at the time that the owner of GM personally invested in the company and changed the name to the current moniker of Frigidaire. 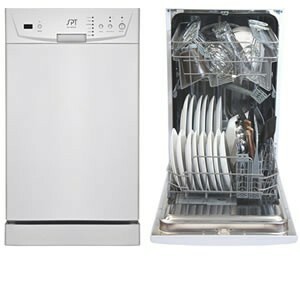 In terms of their 18” dishwasher, the Frigidaire FFBD1821MS is not necessarily the best performing dishwasher we saw. That said, it fits right in the middle tier between our Editor’s Choice pick and everyone else. For instance, while it does not have the largest capacity, it does have the second largest capacity on our list. With a maximum capacity of 12 settings and a general capacity of 10 settings, it will hold at least 2 more place settings than every other product below it on the list. In fact, the main “feature” that swings the capacity of the Frigidaire FFBD1821MS is its silverware basket which fits in the middle of the rack. In terms of the guts, the Frigidaire FFBD1821MS is not really anything special with an 8.5-amp motor, but it is not known for being underpowered or fragile either. To be fair, the 8.5-amp motor might be used to help keep the power rating down which is necessary to earn the Energy Star rating it gets. However, this also allows the Frigidaire FFBD1821MS to be one of the quieter dishwashers on the market generating only 55 dB of noise. Even better, the Frigidaire FFBD1821MS is also noted for being fairly efficient with its water usage as well. Still, one of the best qualities of the Frigidaire FFBD1821MS is the fact that it is made to be easy to use. While few dishwashers are actually difficult to use, the Frigidaire FFBD1821MS goes above and beyond and is one of the best dishwashers for seniors. A big part of this has to do with the fact that the Frigidaire FFBD1821MS is also ADA compliant. On top of that, there is also a setting on the Frigidaire FFBD1821MS made explicitly for good china or crystal dishware–something that seniors are more likely to have in the first place. Kenmore is another company on our list that has a long and storied history stretching back over a century and specializing in consumer home goods. However, Kenmore actually got its start by making products that work with clothing, whether a sewing machine or a washing machine. With Singer having their market practically sewn up, Kenmore sought to capture the consumer home appliance market instead. Still, this 18” dishwasher is not the best performing nor the most convenient, but what it does have going for it is cost – both immediate and long-term. This is because the Kenmore 14663 is the most efficient 18” dishwasher we saw, and it does not even really matter what metric you choose to measure. If you look at the electricity costs, the Kenmore is tied for first at $30 per year, but when you look at the water use, it only costs $21 per year. 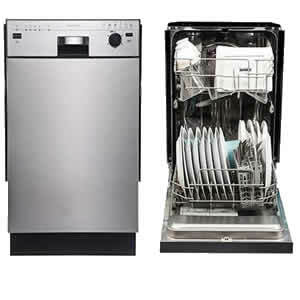 Combined, that makes the Kenmore 14663 the least expensive dishwasher we reviewed to use year in and year out. Even better, the Kenmore 14663 is also one of the less expensive options on our list and very nearly the least expensive dishwasher. Of course, something has to give somewhere, and the biggest difference between the Kenmore 14663 and the other dishwashers on our list is volume. In this instance, we are not speaking of dish capacity as much as we are talking about actual noise. While it is a far cry from the dishwashers of decades past, the Kenmore 14663 is still the loudest dishwasher we reviewed, generating almost 60 dB of noise. That said, while this may be the loudest dishwasher we reviewed, it still does not get louder than a normal conversation. EdgeStar is a bit different than the other companies on our list as it is not actually its own company but is instead a house brand of Living Direct, Inc., and only online distributor. What is more, the brand was only founded in 2004, so it does not have the century-plus experience that most of the other companies reviewed have. That said, the company is one of the fastest growing, can compete in terms of price to value with the best of them, and specializes in consumer home goods. In terms of the EdgeStar BIDW1801SS’ features, you may find them a bit lackluster, though they rarely cause any major issue. For instance, the 8.2-amp motor is the least powerful on our list but only by a difference of 0.3-amps – a difference you and your dishes are unlikely to notice. Of course, this does at least contribute to many of the EdgeStar BIDW1801SS’ best qualities like an Energy Star approval. Moreover, the motor combined with a solid insulator also helps keep the EdgeStar BIDW1801SS around 55 dB of noise while in use. On the other hand, when you look for a budget product of any sort, but especially for an electronic or mechanical device, expect something to be difficult. Thankfully for the EdgeStar BIDW1801SS, this negative does not show up in use but beforehand. Specifically, the EdgeStar BIDW1801SS is by far one of the more difficult dishwashers to install with the water and electrical hardwiring being the most difficult steps. Sunpentown International Inc., or SPT, is another company that has not been around nearly as long some of the other brands on our list. That said, they have still managed to move their way into an already crowded market by providing just a touch more functionality and performance than the budget-priced market without costing significantly more. In fact, there are a couple of features on this particular model that you will not find elsewhere on our list – no matter how prestigious the company. That said, you will definitely need to do a thorough examination of the SPT SD-9252W before installing it. In terms of the good, the SPT SD-9252W has the second most powerful motor on our list at 9.2-amps. While this does add on average an additional 15 kWh to your yearly electricity bill, it is still well within the range to get an Energy Star approval. 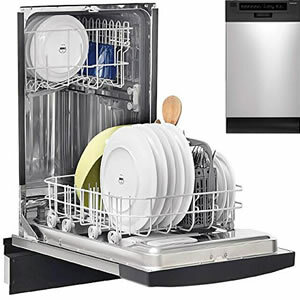 That said, this dishwasher is not known for being nearly as efficient with water usage, though it is still easily within the expected ranges – it is just not better than the other products we saw. What is even more surprising, and impressive, is that the SPT SD-9252W only generates 55 dB of noise. Keep in mind, that 55 dB of noise is tied for the second quietest even with the second most powerful motor. What 18 Inch Dishwasher to Buy? No doubt, the Bosch SPX68U55UC is clear and away the best performing 18 inch dishwasher on our list which is why we gave it our Editor’s Choice. However, the Bosch is also a significantly more expensive dishwasher than the others too. As such, you need to decide whether it is worth it to spend more up front for a better experience and longer product lifespan. 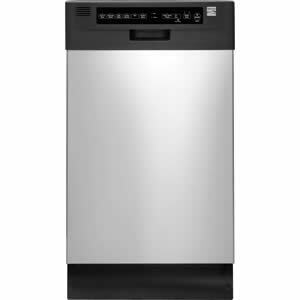 If you are not quite as comfortable with an 18 inch dishwasher that hovers just under a grand, then the EdgeStar BIDW1801SS might be a better option for you. While it cannot really compete with the Bosch in terms of performance, the price is right and everything you need is there. Just make sure to either hire someone to install it or be prepared to take your time – maybe save an entire day for it.